After a break I'm back to George R.R. 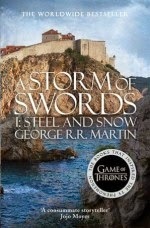 Martin's A Song of Ice and Fire series, hoping to get ahead of the Game of Thrones TV series. I've still got a way to go though, and the third novel A Storm of Swords is the first that was so long it got split into two volumes. The first half, Steel and Snow, comes in the wake of all the big battles at the end of A Clash of Kings, so rather than a huge amount of action there's a lot of politics and scheming. So I can see why the TV series didn't follow the same order but personally I enjoy reading about intrigues more than I do descriptions of action sequences, so I really liked this installment. I'm going straight on to the second half for the consequences of everything set up in this one.